Known as the Pickle King, Samuel Ballton pursued numerous ventures other than farming. He was hard working, determined and possessed of common sense. With those attributes he was able to fulfill the American Dream at a time when the American Dream was not available to most African Americans. That is what makes Ballton’s story remarkable. He embodied the self help principles espoused by Booker T. Washington, who spent summers in Huntington during Ballton’s lifetime. It would be interesting to know if the two men ever met. Unlike Washington, Ballton never attended school. Yet he managed to succeed in a variety of endeavors and become a respected member of his community. Like Washington, Ballton was born into slavery. 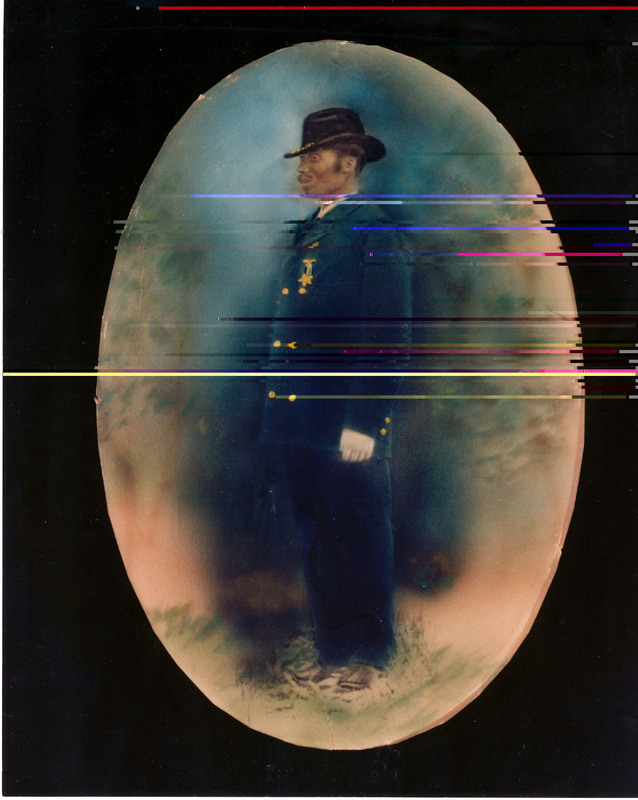 His mother was enslaved on the plantation of Vincent A. Marmaduke, which was located in Westmoreland County, Virginia about 80 miles from Washington, D.C. Ballton was born in 1838, one of nine children. By the time he was seven years old, he was hired out to work on a neighboring plantation. At some point before the Civil War, he met a woman named Ann Rebecca Richardson, who lived on a neighboring plantation owned by John Kricher. In April 1861 they were married by the overseer on the Kircher plantation. The following month, Virginia voters ratified the state’s succession from the Union. Ballton and his wife, who used her middle name Rebecca, were soon separated. Ballton was sent to work as a section hand on the Virginia Central Railroad in the Blue Ridge Mountains, some 200 miles to the west. The rail line was important to the Confederate war effort and was continually damaged by Union Calvary forces, necessitating frequent repairs. On Whitsunday (i.e. Pentecost) 1862, Ballton and five other enslaved Africans decided to take advantage of the four day holiday to escape. The holiday ran from Saturday through Tuesday (June 7-10). They hoped this would give them a three day head start before their disappearance was noticed. With some flour and bacon under their shirts, on Saturday night they walked 17 miles to Frederick Hall, Virginia where they came across the master of the railroad for whom they were working. They were afraid their escape would be short-lived, but the master suspected nothing. They continued on until Wednesday morning when they reached the Union lines about four miles from Spotsylvania. They had walked about 40 to 50 miles. Ballton joined a Wisconsin regiment as a cook. But his ultimate goal was to secure his wife’s escape as well. He first tried to rescue Rebecca a short time after his own escape. Although much of the territory near the plantation was held by Union forces, Ballton did encounter southern troops. He would tell them that he had been captured by the northerners but had escaped and was now returning to his plantation. He apparently was convincing and was able to reach Rebecca. It must have been very soon after his escape from the railroad because their first child was born in February 1863. He didn’t feel he could get Rebecca out safely at that time (i.e. the summer of 1862). He escaped again with three other enslaved Africans. They made it to Fredericksburg. Eventually he came back for Rebecca and the couple along with Rebecca’s mother, and two others made the fifty mile journey to Fredericksburg in 14 hours. Although the date of their escape is not known, their eldest son, Benjamin, was born in February 1863 in Alexandria, so the escape must have been some time before that. They settled in Alexandria where Ballton had found work. In early 1864, Ballton went to Boston. There on March 5, he enlisted in the Fifth Regiment Massachusetts Calvary (Colored), as it was known. Ballton’s tenure in the regiment was eventful. They were among the first to enter Richmond in April 1865. They guarded Confederate prisoners at Point Lookout, MD. The regiment later traveled to Texas. Ballton was honorably discharged at the end of November 1865 and returned to Alexandria. While he was away, a second son had been born the previous September. It is unknown where he lived over the next few years. In 1873, he found work on the Greenlawn farm of Charles D. Smith. How he came to settle in Greenlawn is also not known. Ballton later described the Greenlawn of 1873 as a small community with “one little grocery store, one little butcher shop, [and] one little hotel.” In fact, Greenlawn was also a new community owing its existence to the arrival of the Long Island Railroad just five years before Ballton arrived there. Within two years, Ballton owned land in Greenlawn. In October 1875, he purchased an acre of land on the north side of Little Plains Road east of Broadway from Joel B. Smith. The land is described as being to the east of other land owned by Ballton, meaning he was already a landowner. His wife Rebecca purchased an additional three acres next to their farm on Little Plains Road in 1883. Following the lead of Greenlawn’s Pickle Pioneer, Alexander Gardiner, Ballton grew cucumbers for pickling in one of the local pickling plants. In 1882, the Brooklyn Daily Eagle reported that Greenlawn farms produced 32,000,000 pickles. The only farmer mentioned by name was Ballton, who gathered 1,500,000 pickles from 26 acres. It is unlikely that Ballton owned 26 acres of farmland. It seems more likely that he leased land from others. His success at growing pickles earned him the moniker “The Pickle King.” The term first appeared in the local papers in 1900 in connection with a non-pickle related story. Indeed there seems to be no end to Ballton’s undertakings. For a while he was a purchasing agent for a Boston pickle house. In 1886, The Samuel Ballton Family [or Jubilee] Troupe presented musical performances featuring songs from the “good old slavery days” as The Long-Islander described it. A concert in Port Jefferson was well received, but another in Northport was not a financial success. For several years in the 1890s, Ballton operated a dining tent at the Fairgrounds track in Huntington Station. He seems to have given up the Fairgrounds venture in 1900 when he announced plans to open a boarding house and lunch room in Greenlawn. He also continued to take on manual labor. In 1901, he contracted to cart 2,500 cubic yards of earth to fill Biggs’ pond in Huntington Station so that Allison Lowndes could develop the site. It is unlikely that the 63 year old Ballton did the work himself. He reportedly hired African Americans from the south to assist with his farming and other ventures. His wife, Rebecca, was also a dedicated worker. Her granddaughter Virginia Jackson recalled that her grandmother was an excellent cook. Some families came to the Ballton house every Sunday for dinner, for which they paid Rebecca. It may well be that Rebecca was the cook at the Fairgrounds dining tent and at the lunch room in Greenlawn. Rebecca would also can fruits and vegetables. Rebecca worked in Northport, apparently doing laundry. Another granddaughter, Bernice Easton, recalled her grandmother walking from Northport to Greenlawn with a laundry basket on her head. According to Census records, Rebecca had 14 children, although by 1910 only seven were alive. Rebecca sewed, knitted, and quilted. She would often work half the night on family chores after having worked all day outside the home. She never left the house except to go to work or church. She continued to work for families in Northport as late as 1910 when she was in her late sixties. Samuel Ballton’s most lasting venture was building houses. In fact, he claimed some credit for being an early developer of Greenlawn. He explained that after being in Greenlawn for five years, he purchased five acres of land, improved it, and then sold it for a small profit. This must be land other than the land on Little Plains Road that he had purchased before 1875. Later he purchased 7½ acres in the central part of Greenlawn’s commercial area which he subdivided into 33 lots and built “decent cottages,” which he sold for a small profit. Most land was purchased in his wife’s name. Rebecca was the grantee in at least 22 real estate transactions between 1890 and 1910. It was a common practice to purchase property in a wife’s name in order to shield the assets from potential adverse legal judgments against the husband, who was exposed to potential liability from his work activities. In 1890 and 1891, the Balltons, in three separate transactions, purchased about a half acre of land on the north side of Railroad Street, east of Gaines Avenue. The Balltons “moved into their newly purchased home near the railroad depot” in early 1891. In April of that year, they purchased an extra 25’ of land to the north of the property and secured a third deed that appears to cover part of the same property conveyed the year before, but this time from different grantors. 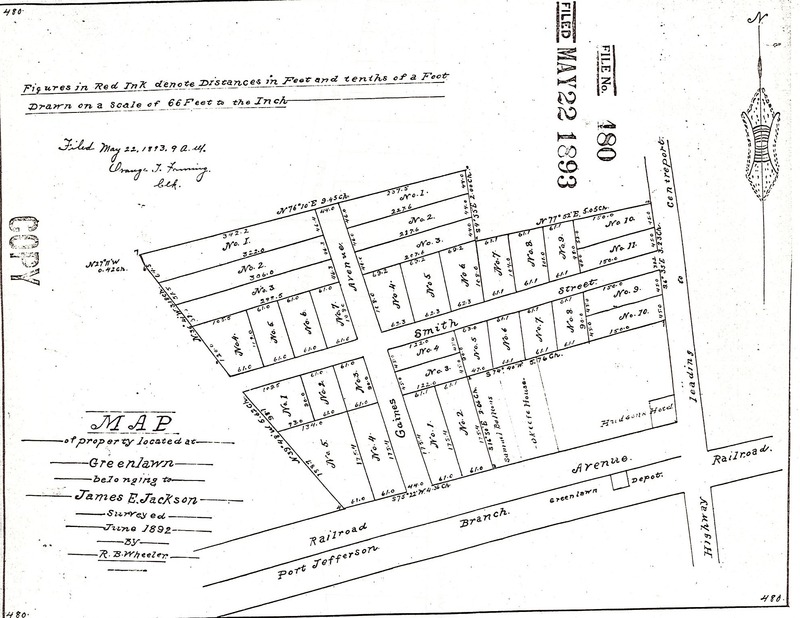 The subdivision map for 7½ acre parcel that Ballton wrote about was filed under the name of his son-in-law James E. Jackson in May 1893. I have not determined when Ballton’s daughter Mary married Jackson. He tragically died a year after the subdivision was filed from complications arising from appendicitis. He was only 35 years old and left Mary with three children. The subdivision encompassed the area north of Railroad Street and west of Broadway and created Smith Street (the first 808’ west of Broadway) and Gaines Avenue (the first 544’ north of Railroad Street). The streets were named for the previous owners of the property. Three houses built by Ballton on this property survive. He built the house on the northeast corner of Smith Street and Gaines Avenue and reportedly lived there until he sold it to Joel B. Smith in 1903. Further east at 3 Smith Street, he built a house for William Hudson, a blacksmith whose shop was next to the house. The third house now sits next to the Hudson House on the west side, after being moved in 1997 from the corner of Broadway and Smith Street to make room for the post office. In 1896, Ballton was listed in Lain & Healy’s Brooklyn and Long Island Business Directory as a Real Estate agent with “Homes and lots for sale in different parts of Long Island.” It is unknown if he conducted any business outside of the Town of Huntington. Another subdivision that Ballton created was on the other side of Greenlawn. 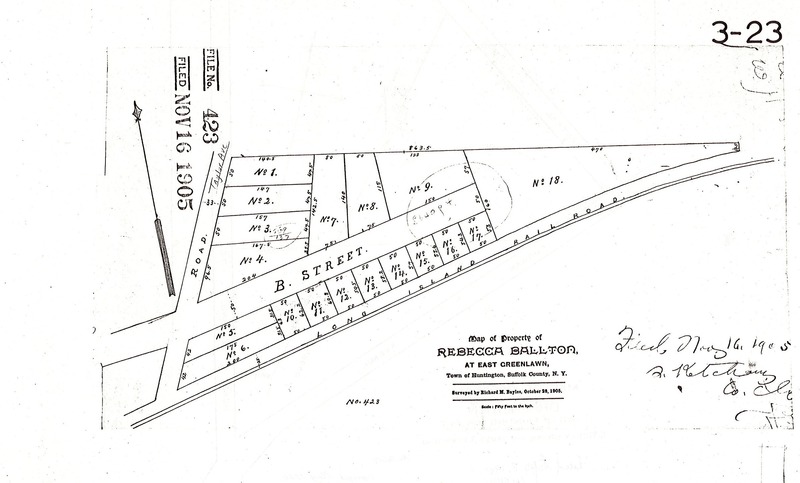 In September 1905, Rebecca Ballton purchased a 3¾ -acre tract of land on the north side of the railroad tracks east of what is now known as Taylor Avenue. The land was surveyed the next month and subdivided into 18 lots. The following spring, Ballton borrowed money from Alexander S. Gardiner to develop the property. WHY huddle up in a tenement paying from $10-$20 a month, when you can purchase a new 4 room cottage, large plot of ground at Greenlawn, adjoining L.I.R.R. ; five minutes to the station; price, $1,000; half can remain on easy installments. See property and owner, Samuel Ballton, Greenlawn, L.I. P.O. Box 43. The house at 34 Taylor Avenue was built to be a store in the hope that a new train depot would be built further east than the original station on Broadway. An advertisement for the house in May 1911 notes that it has been “fitted with shelves for business.” Ballton sold the house and the adjoining lots (lots 5, 6, 10 and 11 on the subdivision map) to his son Charles in October 1912. Ballton’s granddaughter Berenice Easton, who was born in 1915, lived in the house until her death in 2007. In 1910, the house on lot 7 (75 Boulevard Avenue) was built. The house was completed in time for the Balltons to celebrate their 50th wedding anniversary on April 15, 1911. Reportedly the house was not yet furnished, which allowed more room for the numerous celebrants. That house along with two small lots across the street on the railroad tracks (lots12 and 13) were sold in February 1912 to William J. Gardiner. The Gardiner family continues to own the property. A few months after the sale of the house to Gardiner, the Balltons purchased an acre of land across the street on the northwest corner of Boulevard Avenue and Taylor Avenue. By the end of the year, Ballton had a new barn built on this property; presumably the house (67 Boulevard Avenue) had been built before the barn. Ballton also built at least one house in Northport, on Woodbine Avenue. Despite his various ventures, Ballton’s occupation was listed as “Day Labor” on the 1900 census and as “Laborer” on the 1910 census. Ballton had his share of misfortune as well. First and foremost, he outlived at least half of his children. In 1892, a Huntington merchant secured a judgment against Ballton in the amount of $30. The sheriff levied on one of Ballton’s pickle patches to secure the debt. But the sheriff failed to harvest the pickles, which needed to be done every day. As a result the plants went to seed and were worthless. Ballton sued the sheriff for $100. No report of the result of the suit has been found. Fire was a recurring problem for Ballton. In 1885, he was burning brush probably on his Little Neck Road property. The fire spread to an adjoining property and burned 15 acres of woodland before it was brought under control. Fifteen year later, Ballton’s house was damaged by fire resulting in $200 in damages and the loss of $75 cash. Four years later the result was much worse. Ballton’s house in Centerport, which was less than a year old, and its contents were destroyed by fire. Ballton was guarded in what he said. One of his favorite expressions was, “If I hear the truth of it and I guess I do.” But he was a committed booster of Greenlawn and of Republican politics. According to a suit filed by Ballton against Commack farmer Manly Ruland, the day before the presidential election of 1900, Ruland contrived to get Ballton helplessly intoxicated and then put him in a wagon and had him dumped in the woods near Commack four miles from his home so that Ballton would not be able to vote for the Republican ticket. Ballton, who was not wearing a coat, awoke at midnight and crawled into a nearby hay stack to keep warm. The next morning, once he figured out where he was, he got back to Greenlawn and went straight to the polls to vote. The jury returned a verdict of not guilty. Ballton weighed in on the three way race for president in 1912 when Theodore Roosevelt split from the Republican Party and ran as a Progressive. Ballton took issue with Roosevelt’s action in waging a third party contest fearing it would split the ticket and give the election to the Democrat, Woodrow Wilson. He compared the Progressives to deserters and traitors. Ballton said he preferred to go down with “colors flying” than to support the Progressives. Wilson won the election with only 42% of the popular vote. Ballton lived in the house at 67 Boulevard until his death in April 1917. Rebecca sold the house at in 1920. 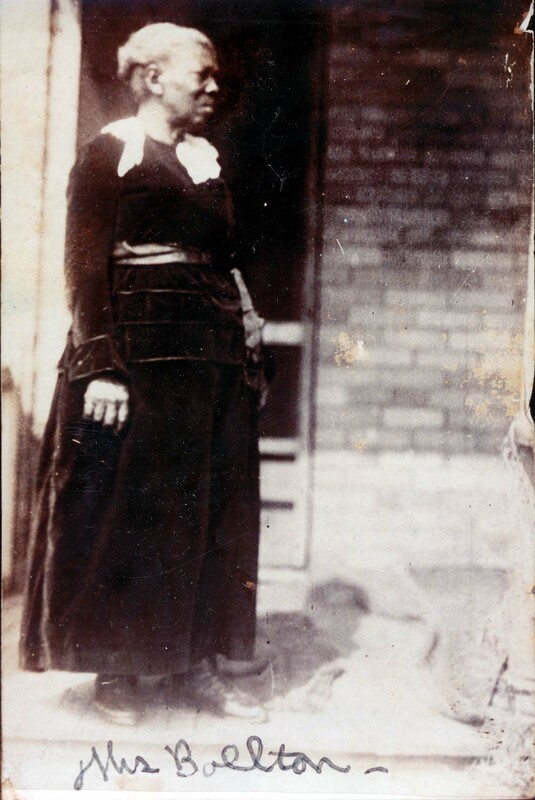 She then lived with her daughters until her death in 1925. Both Rebecca and Samuel Ballton are buried at Huntington Rural Cemetery. Having lived in Greenlawn nearly all my life and serving a couple of terms as president of the Greenlawn-Centerport Historical Association, I am very familiar with the story of Samuel Ballton. He was a very enterprising man – a Civil War veteran, cucumber pickle farmer and developer. As indicated, the homes he built in Greenlawn after years of growing pickles all still stand. In fact, those that were near Gaines Avenue were right around the corner from where Lois and I lived until we sold and moved to PA. His daughter, Jessie Easton, and her daughter, Berenice lived in a house he built next to the railroad tracks, that was originally intended to be a general store, not far from the home in which I grew up. I knew them both from infancy and they were pretty much family to all of us in Greenlawn who knew them. They were members of, and regularly attended, the Greenlawn Presbyterian Church which is where my family and many in Greenlawn belonged. My mother used to tell me that when she would walk past their home with me in my stroller (on our way to meet my dad’s train) she would often stop to talk with Berenice and her mom if they were outside. Her mom was a large woman whom I (then about 2 years old) used to think was Aunt Jemima because she always wore a bandanna around her head and looked very much like her. By contrast, I remember that on Sundays, Jessie was always dressed “to the nines” for church in a flowery dress and large brimmed, her daughter Berenice, always looking resplendent, too. Berenice, the only black student in the Greenlawn Public School in the 1920s, was a very well-read woman. As an adult, she did housework for many local families and her mother did laundry for local folks, which is how they supported themselves. After he mom, died, Berenice continued to attend church every Sunday until, in her 90s, she fell ill and ultimately passed away. (I remember that she always looked much younger than her years in later life.) Before she passed away, I called on her while she was mostly bedridden and had a nice visit with her. I loaned her a book I had purchased some years before about a young, black woman artist who chronicled plantation life in the South in primitive-style paintings, much like those of Grandma Moses. As a student of both history and art, she found it fascinating and thanked me for bringing it to her. I will always miss Berenice. She was a part of my life from childhood well into adulthood. Letter dated February 11, 1918 submitted by Rebecca Ballton to secure a veteran’s widow’s pension. Transcription in the archives of the Greenlawn-Centerport Historical Association. This was not the regiment featured in the film Glory. That was the 54th Regiment Massachusetts Volunteer Infantry. The source for the early years of Ballton’s life is a profile of him that appeared in the Brooklyn Daily Eagle on September 8, 1910, page 82. Ballton would have been the source for the information in the article. Suffolk County Clerk’s Office, Deed Liber 217, page 380. Deed Liber 277, page 190. Brooklyn Daily Eagle, September 8, 1910, page 82. The Long-Islander, February 6, 1914. In 1910 the house was listed as one of hundreds throughout Suffolk County that had been sold at a tax sale (The Long-Islander, May 6, 1910). However, Ballton continued to advertise the property for sale in the following years. Perhaps he purchased the property at the tax sale. The Long-Islander, March 25, 1904. Deed Liber 342, page 224. Various sources give different numbers for the number of children in the family. The census records indicate 14, of whom 7 were still living as of 1910. Brooklyn Daily Eagle, November 14, 1900. The verdict was reported in The Long-Islander, November 16, 1900. Northport Historical Society has several pictures of Ballton in his Civil War uniform proudly marching in Village parades with other veterans.